The concept of Fibonacci Bands were described by Suri Dudella in his book “Trade Chart Patterns Like the Pros” Section 8.3, page 149. The bands are derived from Fibonacci expansions from a fixed moving average and display possible areas of support and resistance. 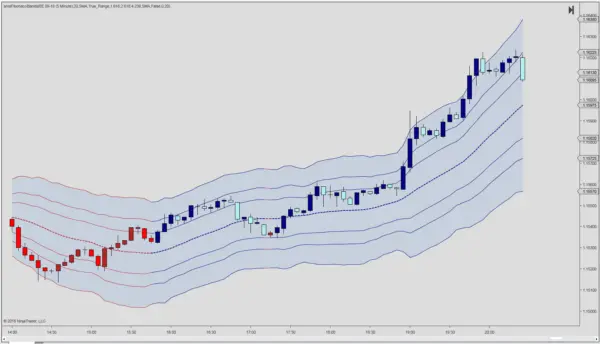 In order to calculate the Fibonacci Bands, three Keltner Channels are applied. The following default Fibonacci expansions are used for each Keltner Channel: 1.618, 2.618 and 4.236. One may look for trend reversals by watching the price action near the extreme Fibonacci Bands (upper and lower). When prices trade outside of the band for a few bars and return to the inside the bands, we may look at a reversal scenario. By using multiple time-frames one may take a short time-frame signal which aligns with a larger time-frame scenario. Generally, you’ll want to trade in the direction of the larger time-frame whereas the short-term support/resistance is used for defiing entries and exits. The trend is defined via the slope of the midband which may be displayed via a column in the Market Analyzer.